The Optimist is quite simply, the dinghy in which the young people of the world learn to sail. Sailed in over 110 countries by over 150,000 young people, it is the only dinghy approved by the International Sailing Federation exclusively for sailors under 16 years of age. Most parents find that sailing gives young people a great sense of personal achievement. In addition the skills required to improve sailing performance both on and off the water, it helps young people develop a more organised approach to other non-sailing related activities. Over half of the dinghy skippers at the last Olympic games were former Optimist sailors. The boat was designed by Clarke Mills in Florida in 1947. Optimists first came to Europe in 1954 when a fleet started in Denmark. 2.31m (7’6.1/2″) long, 1.13m (3’8″) wide. Weight 35kg (77lbs). Easily transported on top of any car, (where it will drip water over your shiny paint-work!). Available in GRP, wood or wood/epoxy. The Optimist dinghy is safe and simple enough for an 8-year old but still exciting and technical enough for a 15-year old. MYSC provides beginner training from 8 years of age. Is your child a competent swimmer? Comfortable about the prospect of trying sailing? (The prospect of being alone in charge of a boat is often daunting to a young child and this introduction to the water is the most important step). Are there any older brothers or sisters in the family involved in sailing. This is often a great help. But Surely They Should Not Race at hat Age? It depends what you mean by racing. The secret is to let the young sailor race to the level that he or she is comfortable with. 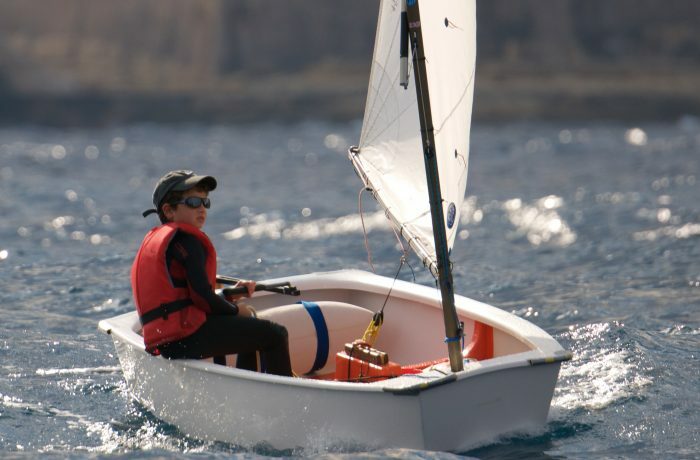 Some children like to race as it brings out their competitive instinct, whereas others enjoy the training and sailing with others. No matter what your children enjoy, sailing develops character. What is the maximum age to sail an Optimist? Sailors are permitted to enter the Optimist Worlds and other big regattas until the are 16, i.e. until and including the year in which they have their 15th birthday. But some sailors do get too big before then. When am I too big for the Optimist? A lot depends on weather conditions. If you sail in a place that never gets more than 8 knots in summer, you are going to have problems winning over 55 kg. No. MYSC has club boats which it either rents or includes in the summer sailing course fee. What are the tips for buying an Optimist? Optimists can be found available in GRP, wood or wood/epoxy. Most likely to be GRP and built to IODA 95 standard so that there is little (if any difference) between different brands. Some brands have a higher resale value due to a perceived better build quality. For diplomacy reasons, this information pack will not attempt to score one brand against another. The best advice is to ask a parent who has a reasonably current technical knowledge of optimists to ‘survey’ the prospective secondhand boat for you.